There are a small number of things in the world that possess the power to really make you realise just how minuscule a place you occupy in the big old universe. 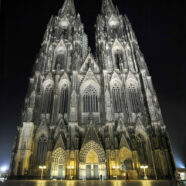 Köln Cathedral is one of these things. It towers above the rest of the city, its spires always visible in some distant direction wherever you are, unless they are shrouded in fog like a heavenly gate. Standing before it in Köln’s main plaza, you cannot even see the top, though you are still as awed as ever. The doors alone are immense, deep-set in spectacular mullions like the eyes of a monstrous hermit crab. Poised beside them like an unofficial ticket-dispensing machine is a priest with a touch of the circus magician about him, dressed in a sweeping red robe, and probably carrying a small wooden box to collect “voluntary” donations for the cathedral. But even if he does sidle into your path and smile a few coins out of your purse, you will soon see that he does so with good reason; for the interior of the Dom is a beautiful, beautiful place. The nave is high and arched, and at ground level you walk between blocks and blocks of pews, separated only by tall ribbed pillars, candlesticks and the occasional lost foreigner. Tour guides squeeze between the mobs of visitors while frantically wafting the flimsiest of signs above their heads, hoping that the rest of their group are bobbing along behind them. The looming stained-glass windows of the cathedral seem to cycle through more artistic periods in a few square metres than a full art gallery does in three floors; there is everything from the flat and simple archaic designs to the more modern, deep, bright works to one almost futuristic window composed entirely of tiny coloured squares. The altar squats upon a dais in the centre of the cathedral, cornered by four candelabras that are manually lit before Mass by one of the walkie-talkie-wielding priests (don’t ask). Perhaps best of all, scattered around the building at different intervals are some highly entertaining, photo-worthy shrines and monuments to various saints. The majority of these sculptures depict the saint in question as a laid-back, free-living, hippy-esque dude, lying on his side, resting on an elbow, with one knee bent and even the occasional small child sitting in his lap. Once again – don’t ask. The cathedral also features a crypt underground and a viewing platform at the very top, neither of which I have managed to experience so far, but judging by the rest of the building I am sure they would both be fascinating appendices to a stroll around the inside. The cathedral is one of the true must-sees in Köln… but let’s be real, it’s huge, so it’s not like you’re going to miss it. On foot of the trip to the cathedral, I paid (literally) a visit to the Walraf-Richartz Museum, which ranges in content chronological from Medieval Art to pointillism and the Impressionists. While always quite interesting, it would not rank as one of the finest galleries I’ve seen. It has probably the best ever work by artists you’ve never heard of and probably the worst ever work by artists you have heard of. The top floor, for instance, boasts art by such world-famous names as Claude Monet, but has actually only succeeded in acquiring the lesser pieces of those artists, while their masterpieces are luxuriating somewhere faraway in Paris or London. There is a restaurant that doesn’t serve restaurant food all the time (despite what we were told at the information desk) and an exceptionally expensive gift shop full of hardbacked art books that would necessitate wheeling a trolley everywhere to take them with you. Nonetheless, though, the Walraf-Richartz Museum is certainly worth a visit, but if I were you I just wouldn’t make it the only gallery I see in my time in Köln. A fine day overall of some unforgettable sight-seeing. I expect I’ll find myself with repetitive strain injury from all of the photography I was doing, or worse still, actually get good at using a camera. But at least in years to come I have the moments so immortalised, that I can flick back through the virtual photo album and remind myself of that shining holiday that I will never have forgotten anyway.